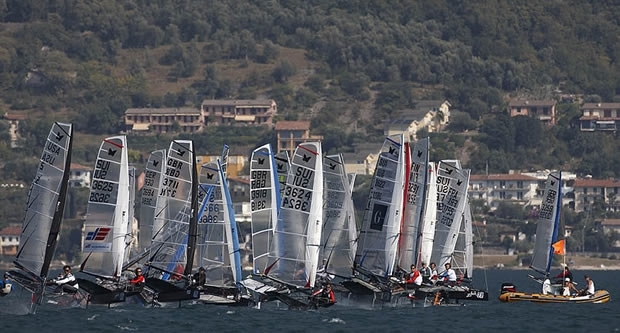 After his victory in last week's Zhik Nautica Italian Moth Open, Australia's Scott Babbage got to a strong start on the opening day of the Zhik Moth World Championship being held on Lake Garda, Italy. In a massive field of 117 boats, the fleets have been divided in two racing on inner and outer loop courses. These provided different challenges - tacking on the layline first would practically guarantee a win on the inner course. The dramatic mountains surrounding Lake Garda not only provide a stunning backdrop but also provide more pressure closer you sailed to them. This required little tactical brainpower and the leader at the first top mark provided they avoided mistakes would bag the win. Meanwhile on the outer loop, out in the middle of the lake, it was much more complicated, or even “spooky” as Bora Gulari described it , the breeze harder to read and there being no favoured side. Sailing in the light tricky conditions, in the blue fleet on the outer course, Babbage posted three bullets while in the yellow fleet the first race was won by the USA's Eric Aakhus with races two and three claimed by another Australian, Josh McKnight. Unfortunately in the conditions the form book has been shaken up. As a potential favourite Joe Turner put it: “This was probably one of the worst days of Moth sailing I have ever had in my life. The boat was going very good but the driver was a bit of an idiot. It was a tough day and I think the start line wasn’t set up very fairly. It was extremely biased in the pin end and every one was port-tack starting. People were too scared to start on starboard. Former World Champion Bora Gulari added: “On the outer loop it was kind of spooky. When I chose the left, the right would pay and when I chose the left, the right would pay. I was a little bit lost on the outside course. I would say that my boat speed was okay, not great but I’m still working on it. It’s still the qualification stage so we have a couple of days before the final showdown. Chris Rashley is currently the top British sailor in ninth while former World Champion Simon Payne is in 16th. Similar conditions are forecast for tomorrow with Italy mid-heat wave with record-high temperatures that arent allowing the Ora, Lake Garda's famous afternoon breeze to develop properly.